X:site Carlisle – Welcome to X:site Carlisle webiste! Welcome to X:site Carlisle webiste! Starts at 6 p.m., ends at 8 p.m.
X:site is a high-energy bi-monthly evening celebration for children in school years 3-6! It is two hours of silly games, live music, videos, creative prayer, crafts, drama, small group times and Bible stories. 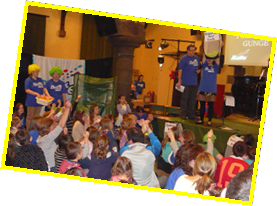 X:site aims to be an event where children can unite together from churches across Carlisle and the surrounding area, to be excited and encouraged in their faith and feel part of the wider Christian community. Where some churches have regular contact with a small number of children, these children can have regular contact with many more children. 85% of Christians make a commitment to God between the ages of 4 and 14. As well as supporting children who already have contact with a local church, X:site aims to be a place where children will be confident about inviting their non-Christian friends to come and learn more about Jesus. X:site works in partnership with Scripture Union. Although the event is run by volunteers from local churches, Scripture Union provide planning and support. It is fantastic working with a team of Christians from other churches doing X:site. Come and be part of it! Also 14– 17 year olds, come and meet other teenagers and be part of our Junior Team. ADVERTISEMENT DISCLAIMER: as this website is hosted for free , we are not in cntrol of the occasional ads that are on this page. Please let us know if any of them are offensive or not age appropriate by emailing us here.